Engaging the World is Simon Fraser University’s motto; founded by a team of SFU graduates, U-bicycle keeps this motto at heart by engaging with various cities, locals, tourists, and organizations to connect with the community. By promoting seamless connectivity and supporting smart city programs, U-bicycle’s dockless bike sharing platform continues greening our world, one bike at a time. U-bicycle team is led by our CEO Grace Min, an SFU graduate. As a serial entrepreneur, Grace founded three businesses in the travel, realty, and international trade sector before founding U-bicycle. Her entrepreneurial acumen and passion in cycling led her to bringing U-bicycle to the North American market, making positive impact to the environment and society. Angel Fu, U-bicycle’s Chief Strategy Officer, also an SFU graduate, was as an Executive Director at Goldman Sachs Hong Kong before leaving her position to join the U-bicycle Team in early 2018. U-bicycle’s Marketing Manager, Finance Manager, and many other team members are also SFU alumni. U-bicycle’s strong connection with SFU is also enhanced by working together with the Co-op department to hire talented SFU Co-op students. With strong backgrounds and collaborative skills, the whole team works hard together in providing mobility and enriching the lives of people who live, work, and play in the new generation of Smart Cities. U-bicycle provides affordable and short-term transportation solutions to the residents; improving urban mobility by making the first and last kilometre faster, cheaper, and healthier for the users. By using U-bicycle’s Smart Bikes, each user is reducing their carbon footprint and helping reduce traffic congestion. This is why to U-bicycle, our company’s success is far more about the number of the bicycles on the road; CEO Grace Min noted that she is proud of the positive impact the business will have on the community and for the next generation. Launched in September 2017 in Victoria, U-bicycle now operates in 8 cities — 3 in Metro Vancouver and 5 in Vancouver island. You can find our smart bikes in Port Moody, Port Coquitlam, and soon in Richmond. With 20 employees in North America and a few members soon to be hired to support expansion outside BC to improve the communities, U-bicycle is growing exponentially. U-bicycle is committed to hiring local talents and partnering with business in its area of operations to promote the local business and employment opportunities. After a successful launch of our popular bikes, U-bicycle is experimenting on another new product: electric scooters. 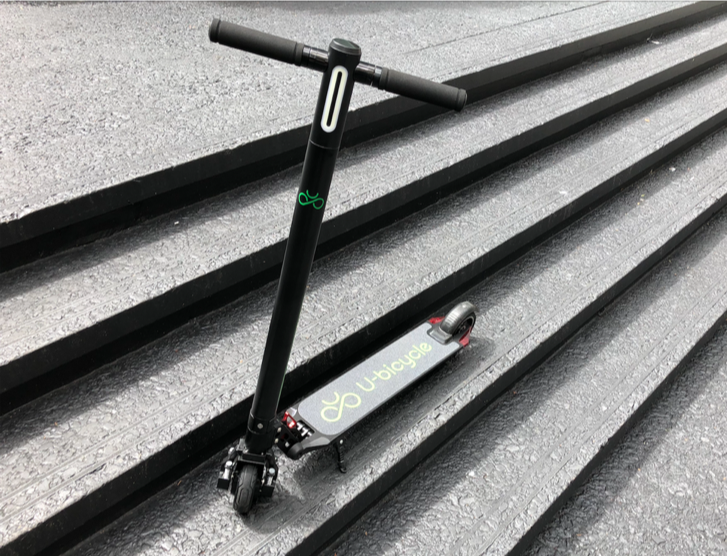 The scooter is foldable, easy to carry around, and at the same time environmentally friendly because it uses a rechargeable Lithium battery, the greenest option possible. U-bicycle is looking to introduce this new product to the public after addressing all the necessary regulations and approvals. As SFU graduates, we are also looking to bring this matte black finish scooter to SFU! Explore your City with U-bicycle and Let's Go Biking!